Saturday, April 6, 2019 was a historic day for GlobalFingerprints. Jim Scott, Director of Site Launch and Development, signed an agreement with our Vietnam partners that officially launched GlobalFingerprints in Vietnam. 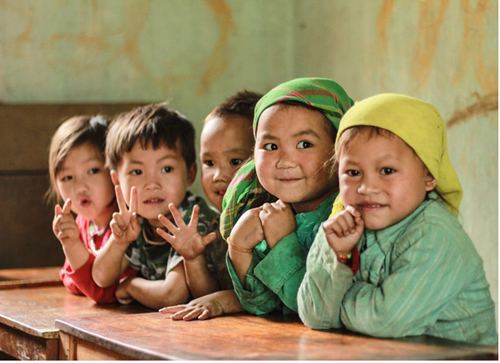 Beginning in June, Vietnamese GlobalFingerprints workers will begin helping poor children go to school, get proper nutrition and receive medical care. And most importantly, they will tell them about Jesus. As exciting as this is, it’s only part of the story. Our national partner in Vietnam is a church-planting network. GlobalFingerprints will love and care for children in six different areas. And they will be accompanied by church planters. Vietnam is a Buddhist country and its people are largely resistant to the gospel. That’s why demonstrating the love of Christ is so important. It helps to tear down barriers so that people are more open to hearing the gospel message. This partnership of child sponsorship and church planting is part of the fabric of GlobalFingerprints. GlobalFingerprints is currently involved with four church plants in Myanmar, two in India and one in Panama. India is considered one of the most difficult places for Christianity. In one Hindu village, parents registered more than 200 children for the GlobalFingerprints program even though they were told it was explicitly Christian. Children met in groups of fifties by age group on Saturday mornings for Bible teaching and singing. Curious mothers wanted to know more about what their children were learning so a women’s Bible study was launched. At a retreat for the older sponsored children, many put their faith in Christ and a Sunday evening youth group was established. One distinctive of GlobalFingerprints is that our workers regularly visit sponsored children in their homes to assess their needs and build relationships with the family. Church planters accompanied the care workers on many of these visits to share the gospel and establish a relationship. The stage was set for a church plant. Two years after the sponsorship program began, the church planters launched a church and it is already strong and vibrant. They report that even though the people are very poor, many are giving to help support the church. Some in the village have tried to push the church out of town. But mothers have come to the church’s defense. They have seen such growth and transformation in their children, they want GlobalFingerprints and the church to continue. This is a living example of GlobalFingerprints mission. We are committed to leading children out of poverty and to Jesus Christ. But we know that transformation is not complete without a church to nurture their faith and the faith of their family. We are so grateful to God that He is using GlobalFingerprints to care for children in need and also to open doors for churches to be planted.